INTENDED TO TAKE THE CITY. And After That "the Whole World,"
"What would you think if you were told that y our husband had lost faith in the belief that he was the reincarnation of Adam and you of Eve?" "Have they got him?" she asked. "I didn't think he would ever be caught." "If he has forsaken the faith what will you do?" "I guess there's nothing for me to do but forsake it, too," she said, rubbing her head in a bewildered fashion. "Did you think bullets would strike him?" "Of course, not. And he didn't, either. If we had, we never would have been so foolish as to go into a fight like we did. l We believed, and believed firmly, too, that while our bullets would take effect in the bodies of the officers, nothing could harm us. We believed that after we had started the fight, those who tried to oppose us would become paralyzed and their weapons fall useless to the ground." "Then it was your intention to take the city?" "To take the city? Yes, to take the whole world. We intended to do that from the moment the fight started." "Do you realize, Mrs. Sharp, that you could have been killed at any time during that fight, but that the police refrained because you were a woman? Do you know that the big policeman, Mullane, whom you shot and who died today, could have killed you at any time he chose? "I have thought a little of that since I have been here. I guess they could have killed me, all of us, maybe. It's strange they didn't. I don't see how I came out alive." She seemed to waver on the forsaking of her faith. She said she did not believe it when told that "Adam" had even been struck with a bullet. She didn't see how it was possible. When asked if she would go back to her old faith, as had Mrs. Pratt, she said: "I had no faith when I took up this. My mother and father down in Texas country were Methodists and when I was little I, of course, was prejudiced toward that denomination. Now it's hard for me to think. I don't know whehter I am receiving new light or the world is getting darker. I don't know what is the right thing to do. I wish I did. I would be more at rest." 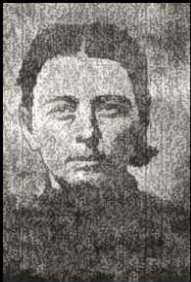 When asked about her shooting of Patrolman Mullane, and the fight by the wagon on Fourth street was described to her, she rubbed her brow in a bewildered fashion again and said: "I remember seeing a big officer; remember seeing a wagon, too, but it is not clear to me. All is in a haze now. It's all like a dream, a bad dream." She was asked if she recalled the time when her husband ran a saloon and a poker room in Texico, N. M., and if it was after he embraced the faith. "Yes, I recall when he played poker and when he had something to do with whiskey, but it wasn't a saloon. He just sold it at the room. I don't know if it was after we had the faith. He quit drinking when he got the faith." "Does he ever drink now?" "Once in a while. We believed that it was not went into the mouth that defiled. It was what came out of it." Anticipating trouble of some sort a detail of about thirty police spent the night in and about police headquarters. Every entrance to the city hall even was guarded and every person who approached was scanned and asked his business. Sharp was photographed by Lieutenant Harry E. Stege soon after his arrival. Then his wounds were dressed by Dr. Fred B. Kyger in the matrons room, the police not caring to take Sharp to the emergency hospital. As he was being led to his cell in the holdover he was asked if he didn't think the devil had him. "No, you fellows all look like angels to me," was his quick reply.